We got up early and headed to downtown Naples, which is a little scary to be honest so we were glad we drove. 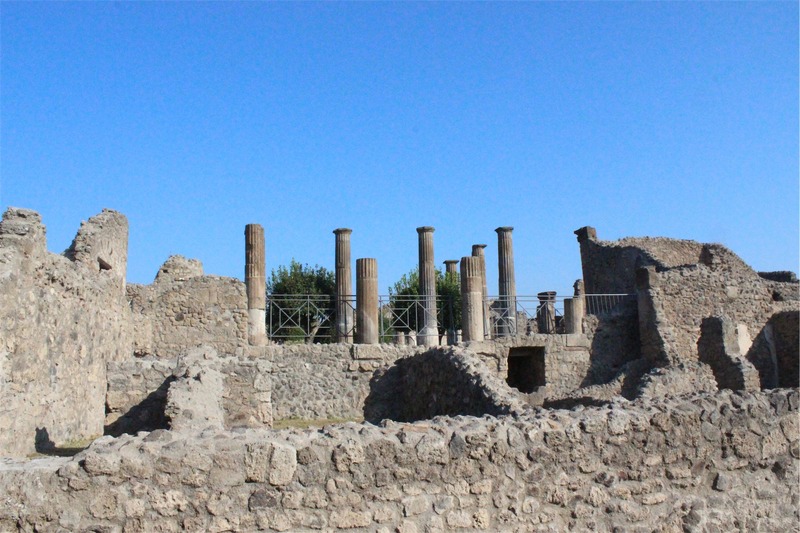 With the car tucked away safely in a parking garage, we headed off to see the sites of the ancient buried city of Pompeii. It was a beautiful clear day and was heading for around 40 degrees in the centre of the city so we were glad we started early. 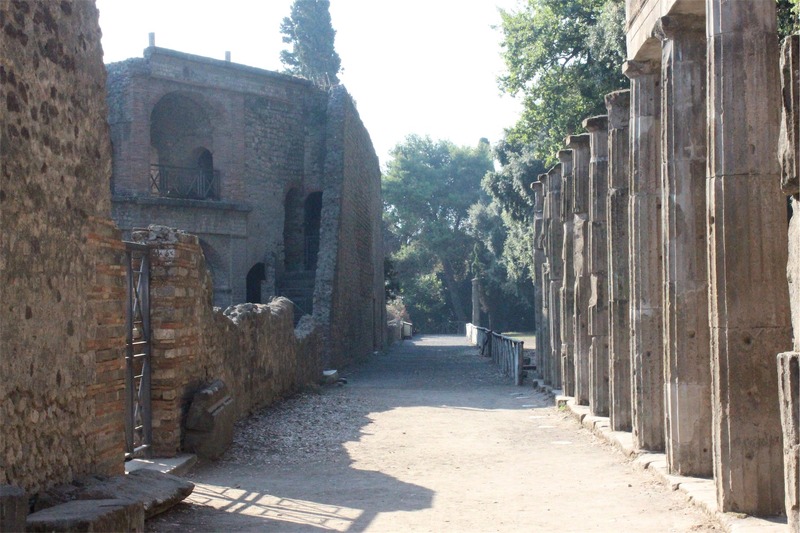 Once we paid to get in and negotiated our way around the bus loads of other tourists, we walked through a gate and went back over two thousand years into the past. The first thing we noticed when we came through the gate was a sort of sports field. As you can see in the picture below, it was huge and they’ve let the grass grow back. 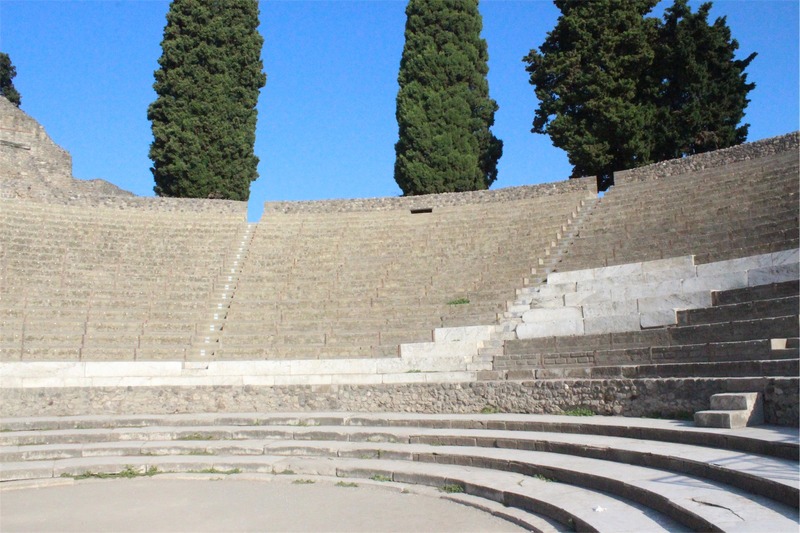 Behind it was a massive amphitheatre which they still use today for performances. The next thing we saw was a temple ruin that was just so detailed. 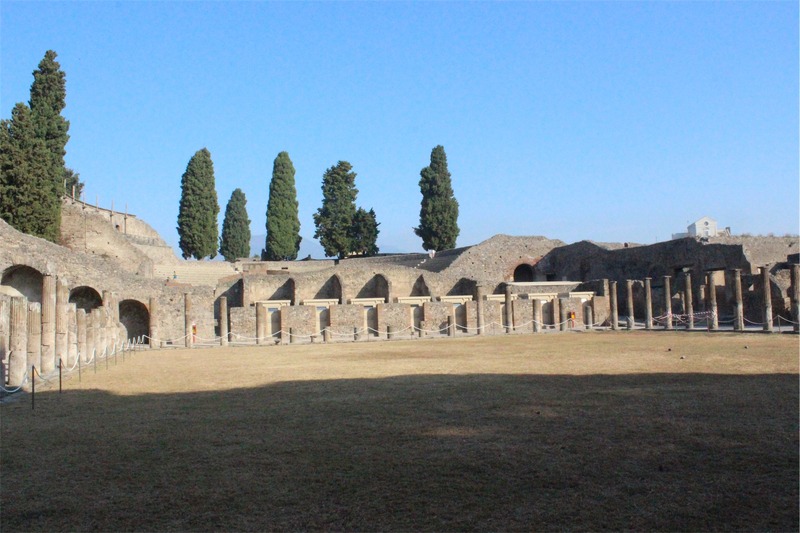 After seeing these amazing structures as soon as we walked in, we spent the next couple of hours just wandering among ruins. Everything was so alien and different, yet somehow familiar. 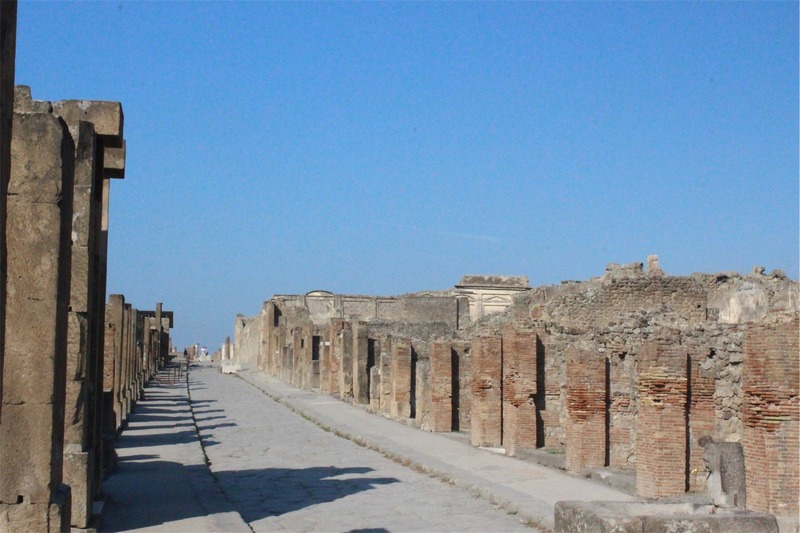 It was just unbelievable to think we were walking around the same city that people were walking around so long ago as if we were there with them. 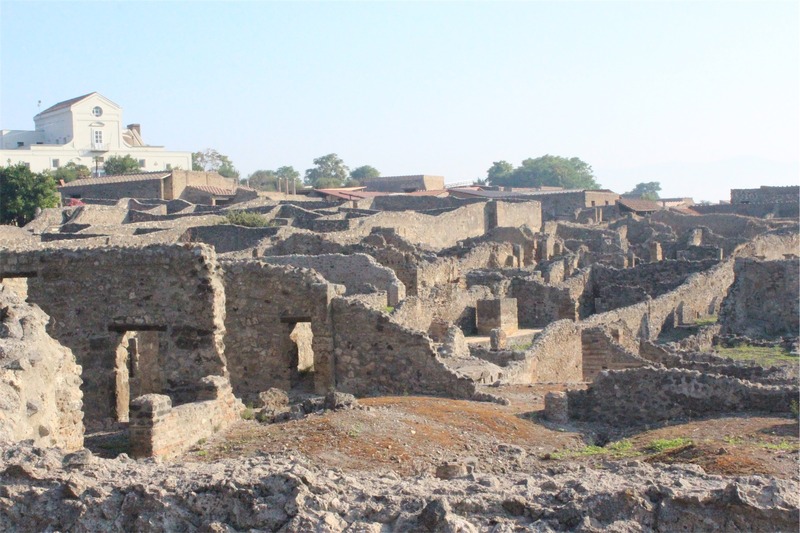 It was great to get an understanding of how the people from Pompeii lived – how the houses and shops were right on the edge of the road, that they had foot paths, that they had drinking fountains and best of all, you could see the actual gouges in the road from the carts that they pulled through the city! 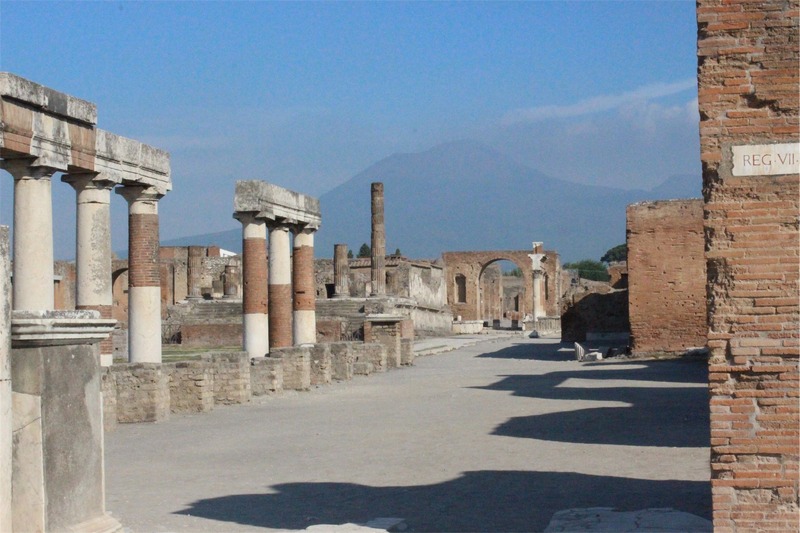 In the main area of Pompeii there is a large open area – courtyard like, perhaps a market place. On one side there is a series of sheds which hold items found during excavation. 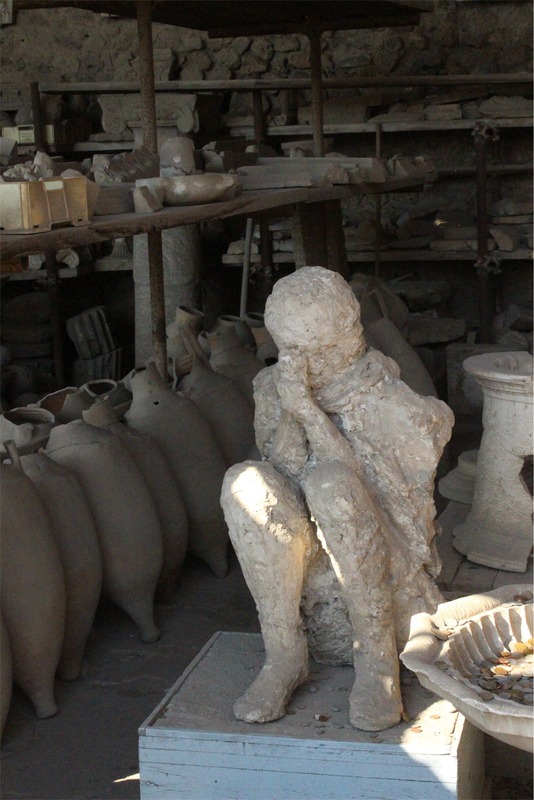 These included plaster casts of bodies they found – which was quite eerie to be looking at. 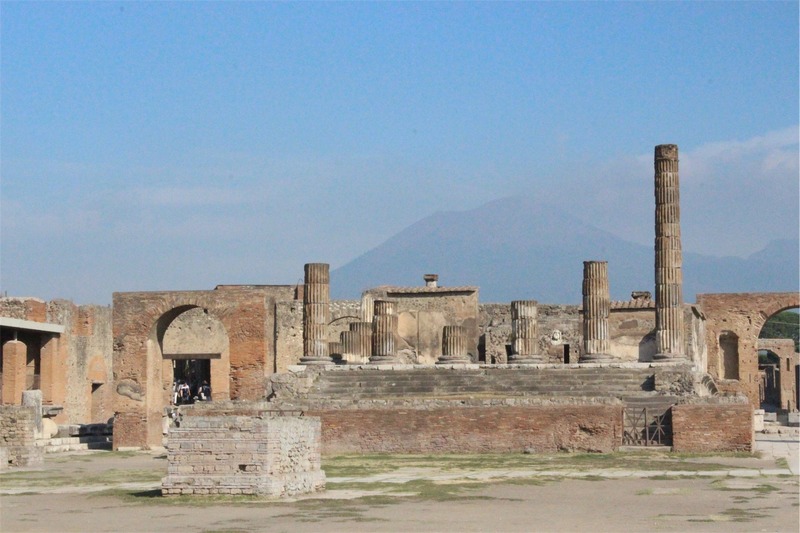 In the background of the photos below, you can see Mt Vesuvius lurking ominously. 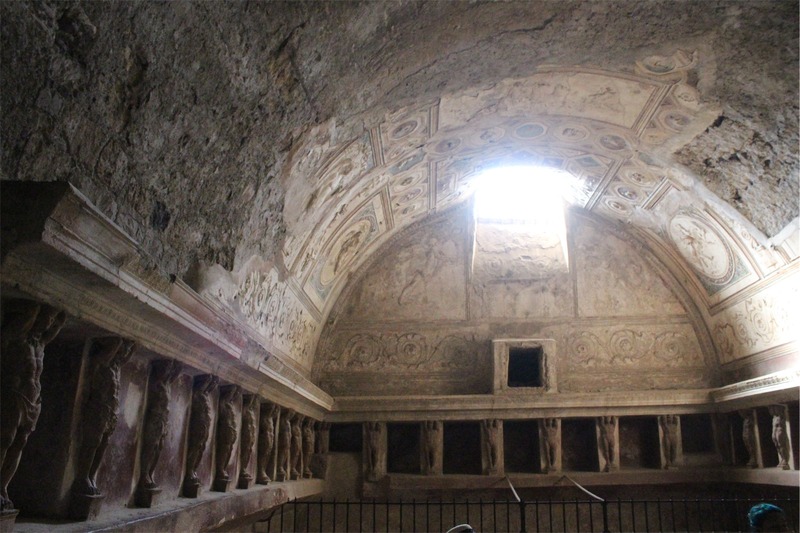 One of the most spectacular structures was a bath house. 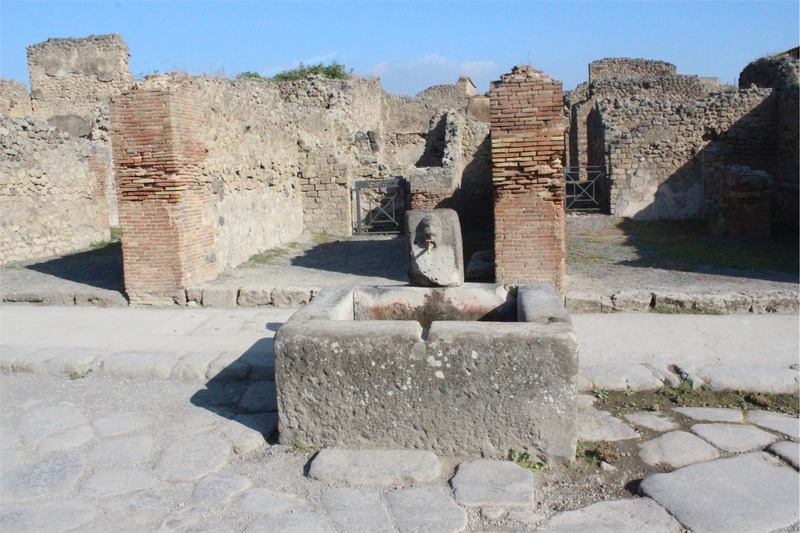 This was a place where rich men gathered and bathed together – kind of like a day spa. The opulence that is still visible is mind blowing. 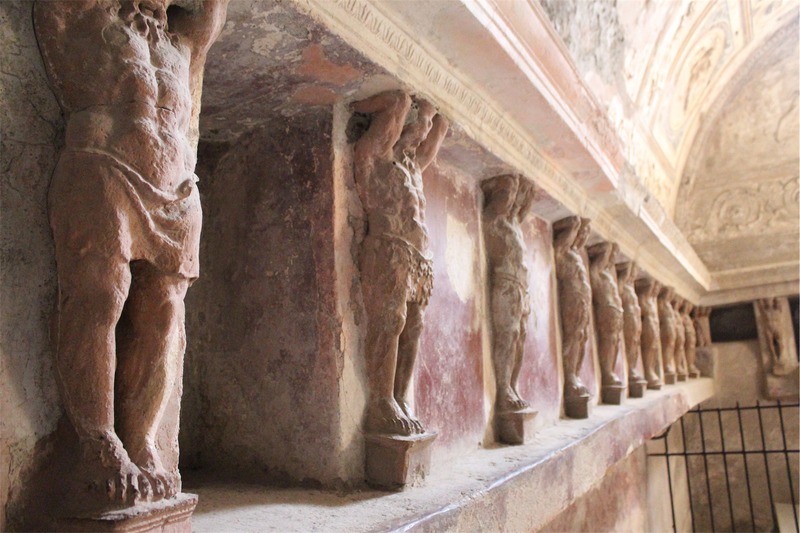 The carving, statues and plaster work are all amazing. 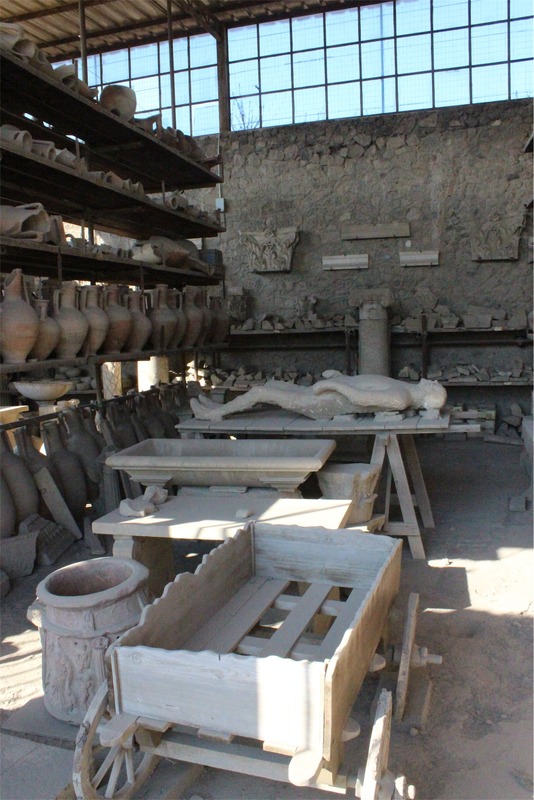 Another couple of insights into life in Pompeii was through a home and a shop. 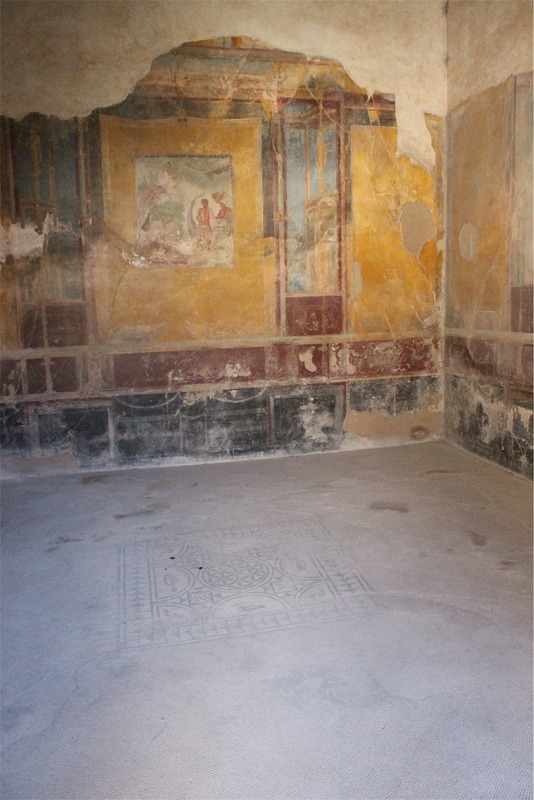 The house was amazing showing exactly how the walls would have looked in a wealthy person’s house. The walls were all brick (as you can see everywhere) but on the inside they plastered over the bricks and then painted murals. On the floor there were mosaic tile pictures as well. So fascinating. The shop that we saw was a bakery. You could clearly see the stone device that they used to crush the wheat into flour for baking. 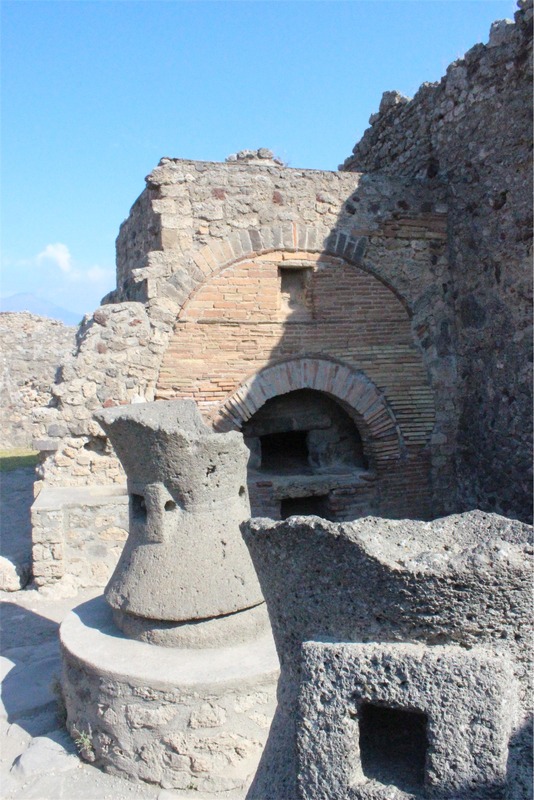 The oven also doesn’t look that different from a modern day open pizza oven. Overall, we had an amazing time and wished we had paid for a personal guide to find out more. We have made a promise to ourselves to watch some documentaries and research more about this fantastic place when we get home. 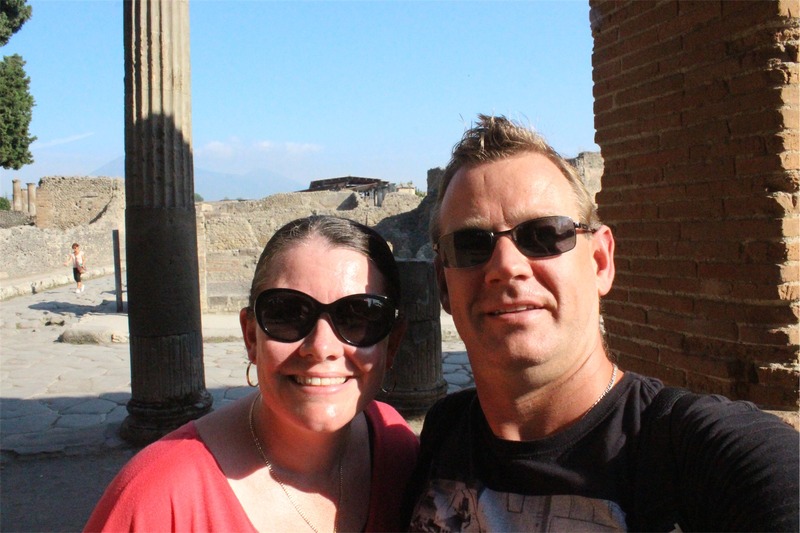 Since it was getting really hot and not many buildings had a roof to provide shade, we left around lunch time and headed off to a beautiful sea side village – Ravello.